I got up at 4:30, about a half-hour later than usual, for two reasons. First, we had just changed to daylight savings time a few days earlier and I wasn't used to it yet. Also, I wanted to stop in Lincoln to rent snowshoes, and the store wasn't due to open until 7:30, or so I thought. Unfortunately, when Muffin and I arrived in town, the store was closed, and wasn't due to open until 10:00. I guess April wasn't as busy a season as January. 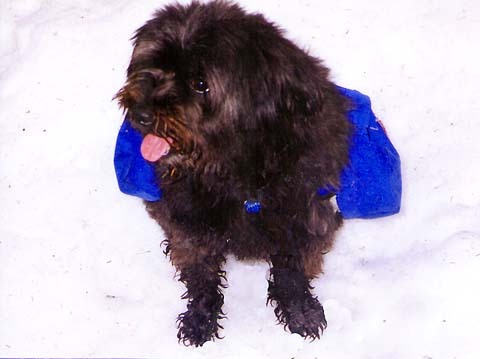 After driving around town for a while trying to find someplace else that was open, I gave up on the snowshoes and we drove east on the Kancamagus Highway several miles to the parking area at the hairpin turn. Because of this, we ended up hitting the trail at 8:30, a little later than I had planned, but still early enough for a full day, as darkness wouldn't descend until around 7:30 that evening. 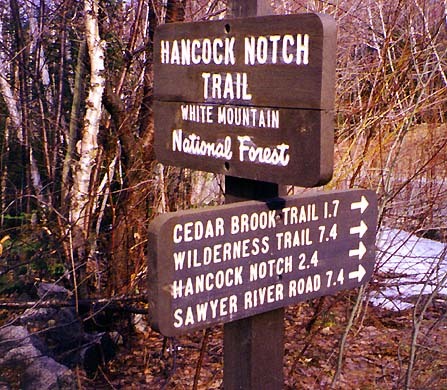 The Hancock Notch Trail follows the bed of an old logging railroad for a long way, so the trail was wide, smooth, and easy to follow, similar to the Wilderness Trail. The snow was packed, and pretty stable even off the narrow strip in the middle, so postholing wasn't really an issue. There were still impressions from recent snowshoes, as well as what looked like ski tracks. In less than book time, we reached the junction with the Cedar Brook Trail. I was hopeful that the firm snow conditions would last, and I wouldn't miss the lack of snowshoes. Trailhead sign. 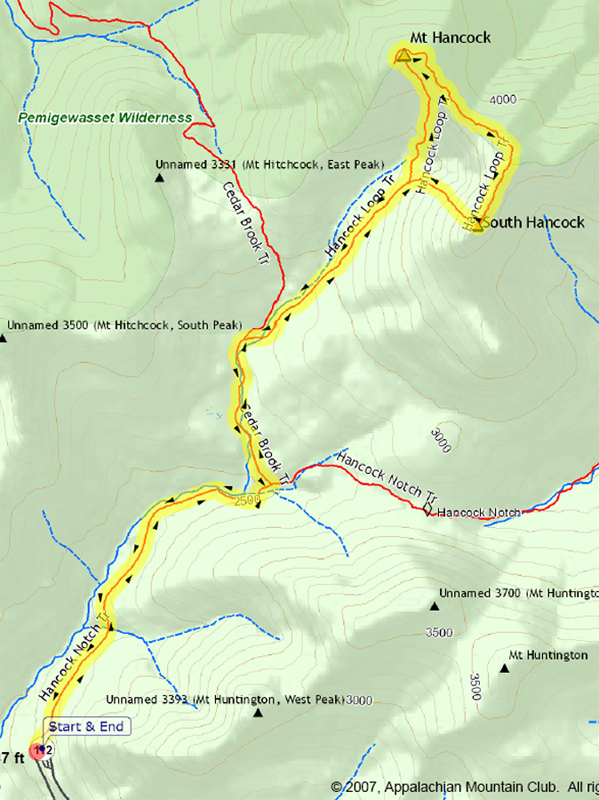 The Hancock Notch Trail begins at the parking lot at the hairpin turn on the Kancamagus Highway. The parking lot itself has good views of the Osceolas. Muffin on the Hancock Notch Trail. This trail follows the bed of an old logging railroad most of the way to the junction with the Cedar Brook Trail. It's wide and easy to follow. 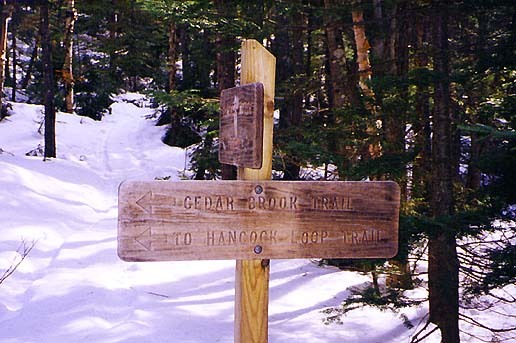 The junction of the Hancock Notch and Cedar Brook Trails. Beyond this point, the Hancock Notch Trail looked much less traveled. Muffin at the junction of the Hancock Notch and Cedar Brook Trails. We rested here for a few minutes before going on.